Graham Ravey of the TOGKF said to us many times his view that goju-ryu karate was essentially a Chinese art. What did he mean? 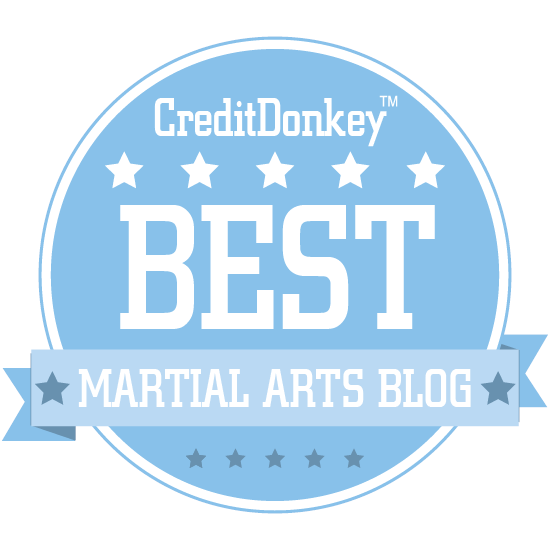 Well certainly many researchers are somewhat dubious about just how much “Chinese” is in Okinawan karate, including such respected writers as Mario McKenna (see "What did you think you were doing?"). However I think they are commenting on whether exact sequences have survived intact in their transmission from China to the Ryukyu islands and whether they are practised with the same emphasis and style as they were in China. Clearly the exact forms have diverged. Furthermore the influence of Okinawan culture on the kata must have left a profound impact on the way they manifest today. However the fact that they owe their origins to China is undeniable – in much the same way as I think it is self-evident that no matter how human races have diverged in appearance, culture and beliefs, they share an common ancestry. Experience in martial arts may help an instructor identify a relationship between techniques in karate (in my case goju) and those in the Chinese external and internal martial arts - even if those techniques are not obviously similar. Whether or not the instructor is correct in discerning such a relationship is, of course, a matter of opinion. As James Sumarac (of Gojukensha/Kakurinkan) said to me recently, there are some people's opinions he would trust, others he would not (incidentally we were speaking about the fact that we felt inclined to trust the opinions of the late, great Chen Pan Ling of Taiwan, master of the 3 internal arts and various Shaolin external arts and arguably one of the most respected and famous masters in modern Chinese history – more about him later). 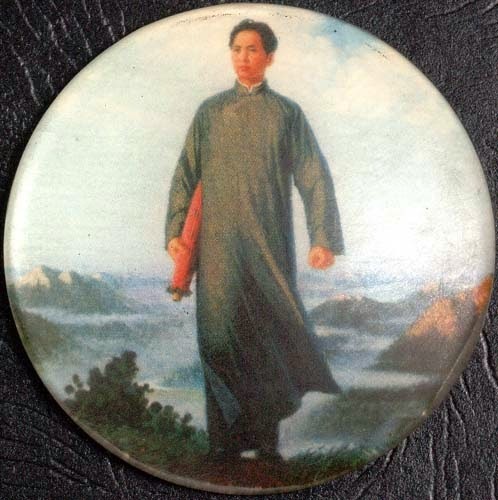 In terms of a comparison with the internal arts, my first and primary instructor, Bob Davies (founder of the Wu-Shin Chi-Dao International Martial Arts College) was later a private student of the late Hong Yi Xiang of Taiwan. 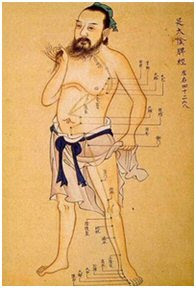 He made certain observations about goju techniques after studying certain internal movements (particularly from xingyi) that were aimed at producing a similar result/effect. I happen to trust (and share) his opinions. I have in recent years had the honour of studying directly under Chen Yun Ching and Chen Yun Chow of Taiwan (sons of Chen Pan Ling) and hope to continue studying with them in the future. My experience of their arts of xingyiquan, baguazhang and taijiquan (systems partly inherited by Hong Yi Xiang) has given me fresh insight (correct or otherwise) into goju techniques. 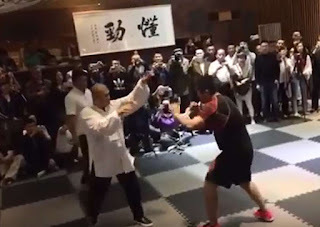 When you are presented with the xingyi way of, say, deflecting a straight line attack using a rising or falling circular deflection, you might find there is very little difference in their result in comparison to deflections found in, say, seiyuchin and seisan. Your focus might then shift to the most efficient angle of interception, the most efficient part of your palm/forearm and the most efficient timing in executing the application of the technique, rather than to debating the formalities of a kata move. The katas may have been modified extensively, but their individual components (ie. the techniques themselves) have remained more or less the same. There are only so many ways to skin a cat, as they say. Consider the techniques of BJJ and classical jujutsu and I'm sure you'll see they have the same components - it is merely the order/methodology/technology of teaching/practising that is different. 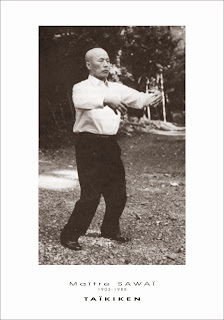 Chen Pan Ling, who studied and collated the various principal forms of taiji in China before the Communist takeover, says in his book on taijiquan that most of the variations he saw were sound, reflecting a mere preference on the part of the instructor. Only in a few cases did the variations constitute mistakes - ie. 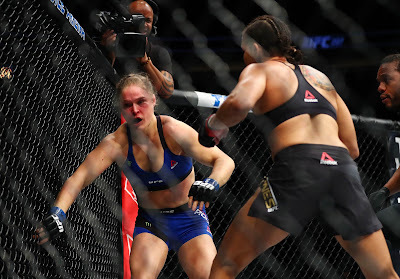 technical errors that could not translate into a valid method of, say, putting someone into an arm bar or striking to the carotid sinus. And so it goes with karate, specifically goju. Most variations of kata I have seen are not "wrong". The individual techniques are quite valid. It's just that the particular school emphasises one application over another. Sometimes this reflects the founder's build, sometimes a particular philosophy, sometimes a favoured tactic etc. On rare occasions I have seen a version of a kata that has movements that are, in my view, biodynamically or technically wrong/inefficient/daft. Accordingly it seems to me that it is appropriate to focus on the techniques contained in kata - not on the sequences in which they are arranged. If a technique in a kata is biodynamically sound and reflects a variety of realistic applications (all of which clearly come out of the same essential movement), then this may well reflect ancient knowledge. Ultimately the question is, "does it work?" If it does, examining whether the the technique (eg, "single whip" which occurs fairly consistently in all the schools of taijiquan) reflects some deeper knowledge of electromagnetism, chakras, the phases of the moon, Buddhist/Daoist methods etc. might offer you some insight into why it works, but then again it might not. The answer might be a great deal more simple (Ockham's razor and all that). I'm always open minded. So what is the "original" way in which the fundamental techniques were performed (eg. mawashi uke/tora guchi)? As I noted earlier, my teacher spent a great deal of time cross-referencing goju with the internal arts to reach his own conclusions on what is the "original" way of doing a particular goju technique. I have my own views on this based on my own study of the internal arts. Ultimately all we can do is each have our own "gut feeling" (influenced by our own technical background and preferences), but we'll never really know one way or the other. A recent example debated on the net is our “tensho kakie” as set out in the video below. In that particular case Taiwanese crane techniques corresponding with the moves in tensho have given me fresh insight into the meaning of that kata. Here is yet another example of Chinese influence on goju kata: consider the final move of shisochin: the taisabaki employed in that move is to step towards the opponent (arguably at an angle) then pivot into a neko ashi dachi and employ a double chest and downward block reminiscent of moves done in Wing Chun and Southern preying mantis – both derivatives of white crane. 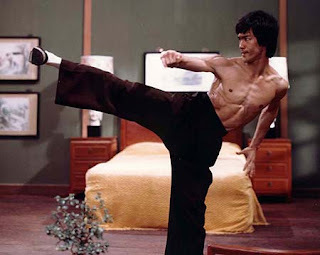 I have copped some criticism of my interpretation of this move as being “just wing chun”. However I feel that this sort of criticism ignores that karate and wing chun are related (albeit distantly). In this regard I note specifically researcher Akio Kinjo’s view that shisochin may well mean “cricket battle” in the Amoy dialect indicating that it is descended from Southern preying mantis (see Mario McKenna's article "Higaonna Kanryo and Nahate"). 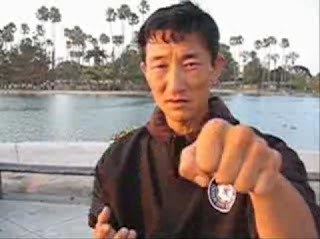 In those cases you would expect the bunkai reflect some similarity in application to arts such as wing chun. Indeed most bunkai I have seen of this move in karate circles ignore completely the taisabaki (step forward and pivot). Instead the applications rely on completely different footwork that is not even implied in the kata. The double block is often performed as a downward block and a rising inverted nukite (finger thrust). I’m not saying this application is necessarily wrong: I just don’t see it as a primary application. My view is that the footwork gives you a strong clue as to just what the primary application was intended to be. 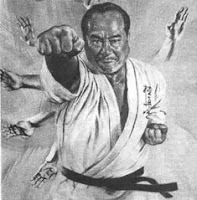 For other examples of a “Chinese” analysis of goju techniques I refer you to my article in relation to "sokumen awase" in the kata seiyunchin and sanseru. 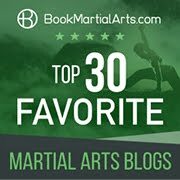 In future articles I hope to analyse other specific karate techniques from a Chinese (particularly internal) martial arts perspective. Go to Part 2 of this article.